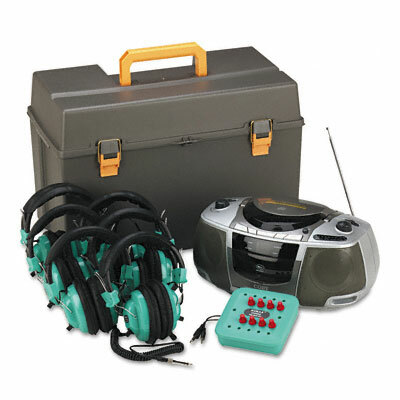 Features a stereo six-station jack box with volume control for each station and six stereo/mono headphones with volume control for each ear. Soft leatherette ear cushions and padded headband covers. Full auto-stop cassette recorder records from CD and radio. Operates on AC/DC power or eight "D"-cell batteries (not included). Tough plastic polypropylene carrying case. Features a stereo six-station jack box with volume control for each station and six stereo/mono headphones with volume control for each ear. Soft leatherette ear cushions and padded headband covers. Top loading CD player with AM/FM stereo tuner and LED display. Full auto-stop cassette recorder records from CD and radio. 110/220V dual voltage.